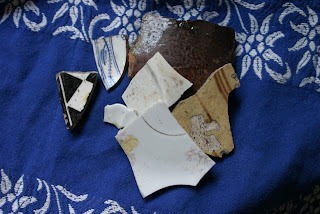 I found these fragments when we were digging up part of our garden for the swimmingpool. When I was a kid I used to sneek into the “grown-up-garden” (which was where the fruittrees and the flowers were, while we had a big spot to play seperated from that). Under those trees I always found fragments like these. Bits of old cups and plates. Parts of pots. I have no clue why. Maybe my greatgrandparents, who built the house, used to throw their broken cups and dishes in the garden to make the soil looser, like you would put them at the bottom of a planter to keep the soil from flowing out of the little hole? I don’t know, but I loved finding them. I also remember digging through the gravel on the driveway to find “fossils”. (Some of those little stones do have imprints that look like fossils). I should have realized there was such a thing as archeology when I had to make choices for my future… But now I have a second chance: dd Deborah is going to study archeology after her exams next year. Strangely though, she wasn’t even a tiny bit fascinated by these fragments just showing up in the mud behind our home. Oh well, teenagers… I’ll never understand them!